The First of Long Island Corporation (FLIC) operates The First National Bank of Long Island, an unusually well-managed and highly efficient bank that has been in business since before the Great Depression. Founded in 1927, it weathered the major economic downturn of the following decade and many economic cycles since, settling on a model of slow, careful growth that now has it operating with 37 full-service branches, 10 commercial banking offices, and two select-service banking centers—almost all of them concentrated on Long Island except for a few in Queens, Brooklyn and Manhattan. 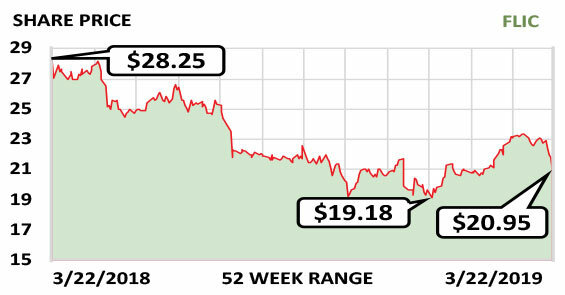 The stock trades at only about one-and-half times book value of $15.27/share, a discount to peers—likely because potential acquirers do not see First of Long Island as an acquisition target. The reason is the firm’s efficiency. There just would not be a lot of cost savings to be wrung out of a takeover. But it is that very efficiency that gives the company steady, reliable growth through multiple credit cycles. Revenue was $104.7 million last year and will likely be $116 million this year and $120 million in 2020. The dividend rises regularly and now stands at $0.68/share/yr., recently yielding 3.12%. Fiscal year: December. Earnings per share: 2020 est./$1.76…2019 est./$1.74…2018/$1.63.